Baby Cargo Stroller Giveaway SIGN UPS! Aren’t the holidays all about giving? And perhaps even spoiling? Well this giveaway is all about spoiling alright! And with a stellar prize like the one up for grabs, it’s an event not to be missed! This is a FREE blogger event. Sign ups will end on November 15th. Everyone gets one free link, with a choice between either Facebook or Twitter, in exchange for posting and hosting the giveaway post along with the Rafflecopter form on their respective blog during the entire event duration. Any additional link is $1. You are allowed a maximum of 4 links, including the free one. All entries must be paid via Paypal to melissa_campeau@hotmail.com. Please take note that the person who will refer the most amount of bloggers will earn a host page spot. 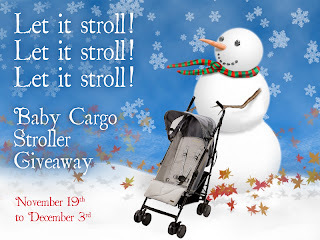 Giveaway will be open from November 19th up until December 3rd, inclusively. Canadian and US residents will be eligible to enter. For more details or to join the event, please refer to the form hereafter.